I bought this striped dress for $11 and never regretted it! 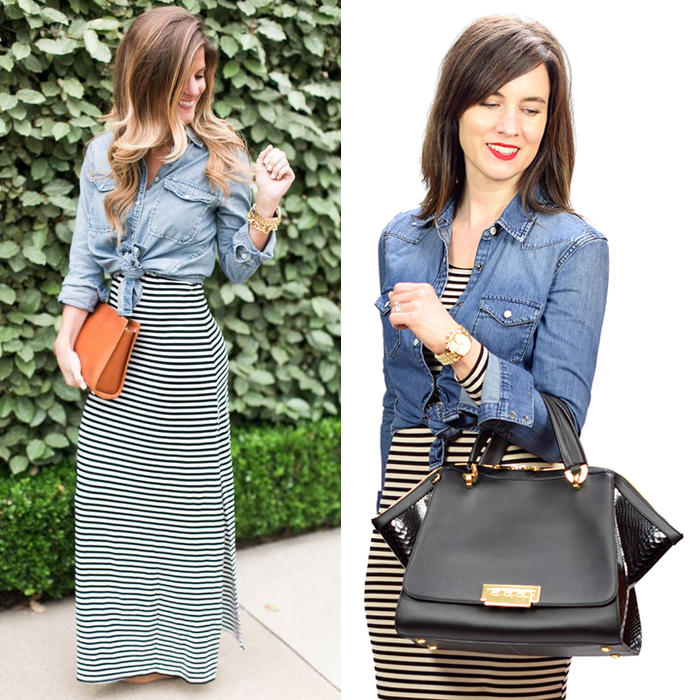 With spring (and hopefully warmer weather), pairing a striped dress with a denim jacket or shirt is a great option. I am wearing it with a denim shirt - but I think it would look great worn with a denim jacket. I love how Brighton the Day paired a cognac bag with her look. It is a nice contrasting color. There is nothing more classic than a little black dress. 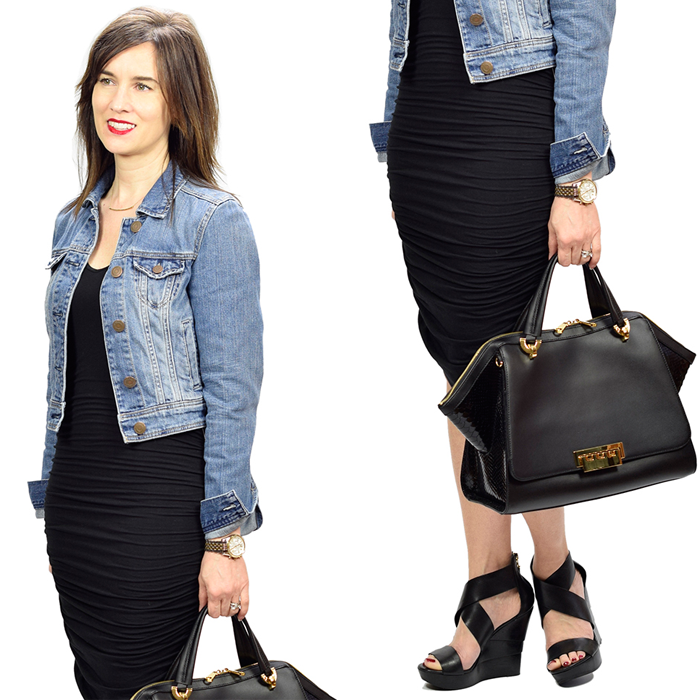 I love black mixed with denim - especially a denim jacket layered over a black dress. I am still so bummed that I got rid of my denim jacket last fall. I was in a bit of a over-cleaning mode - and I am so mad that I gave it away. I have not had any luck of finding a similar replacement! I like this striped tie front shirt. I have been looking for a denim skirt like this. I love this v-neck sweater - that could be worn two ways! This striped chambray shirt is on my spring wish list. This camo bomber jacket is so fun! This is the cutest button front striped dress. I can’t decide if I should get these open toe booties. I have these booties in black - and they are so comfy! This popular circular straw bag is only $50. This fun tee with a ruffle in the back. This cardigan is over 50% off. A cute polka dot dress with a tie waist. My denim jacket has been on constant repeat lately and now that it is finally warming up, I bet I wear it even more. Love both of these looks. 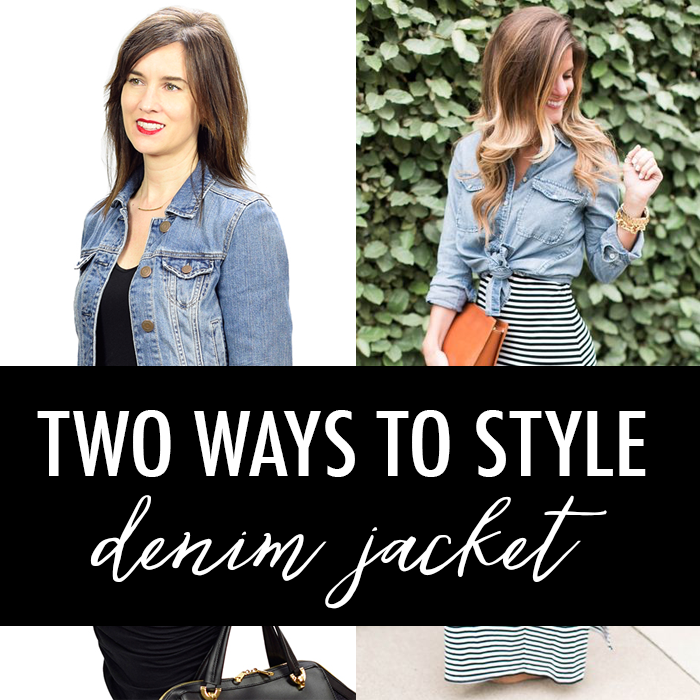 Just love a denim jacket with a striped or black dress! Loving the bootie picks and cute ruffle back tee! Have a super day! You would think that I would eventually be over my denim jacket but, without fail, every single spring I'm excited to wear it again! These are great and classic looks! I love the contrast with the cognac bag and the stripes and denim. Wearing you denim perfectly here. Love the striped dress with denim. Good combo! Cute looks! I love denim with black too.